The Wonder Weeks and Sleep. The impact the wonder weeks have on baby’s sleep. Sleep regressions to expect and how to quickly get baby sleeping well after a mental leap. Babies need sleep. Sleep helps baby develop physically, mentally, and emotionally. Despite the need for sleep, there are many times babies have sleep regressions. These are often tied to The Wonder Weeks, including leap 4, perhaps the most infamous of all the wonder weeks. That is a lot of potential sleep regressions during the course of baby’s first year and a half of life. Not every leap will have sleep issues in association with the leap. The impact of each leap on sleep can also vary from baby to baby. Do not look at this list and despair. During a wonder week, your baby’s brain is developing at a rapid pace. There is always some new skill a baby is mastering during a wonder week. Because of this, REM sleep is longer during a wonder week. During REM sleep, new brain connections are formed (The Wonder Weeks, page 454). During REM sleep, babies (and any aged human) wake up easier. The leaps that seem to impact sleep the most are Leap 4 (four months old), Leap 6 (eight months old), and Leap 10 (seventeen moths old). Baby will tend to take shorter naps and perhaps even wake up in the night. Your baby might have a harder time falling asleep than usual. Your baby might have nightmares during these leaps. 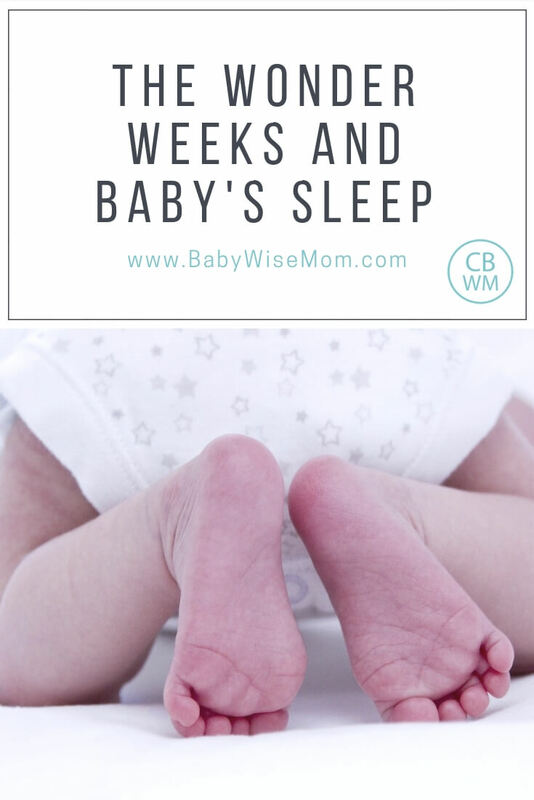 Having healthy sleep habits set up before these leaps come along can greatly help your baby get through the leap with as little sleep problems as possible. Use some sleep props during leaps. This is contradictory to my previous point. Avoid the sleep props before the leap, but during a leap, if you need a prop to help baby get better sleep, do it! A swing, rocking baby back to sleep, a pacifier…baby’s brain needs sleep to develop through the leap. Short naps do not help that process. Also, do not try to change up baby’s schedule during a wonder week. You may change things to the point that baby can’t sleep well when the leap is over. You can read more for help handling these wonder weeks as a Babywise mom. The Wonder Weeks can be quite stressful. It can feel doom and gloom, especially when it looks like baby will always have disrupted sleep. Why bother? Remember that not every mental leap will have horrid naps. There are things you can do to help with the sleep if baby’s naps are bad. Sometimes a wonder week is simply just a grey period. You can follow the Wonder Weeks without completely stressing out about them. Ignorance can be bliss. I didn’t know about The Wonder Weeks book with my first two babies, so I just had times my baby was fussy and worked through it. It can be nice to know the reason, but it can also cast a shadow over your days as you look forward and realize things will get rough. So pay as much attention as you can without making yourself miserable. Get your copy of The Wonder Weeks here.